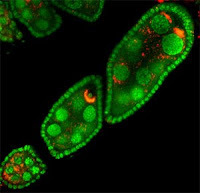 Talk about manipulative little buggers - Wolbachia pipientis are alpha proteobacteria that infect a very wide variety of insects and other arthropods. Like mitochondria, they are vertically inherited from mothers to offspring. But, they get very cranky if they don't get their way. In some cases, they kill off infected males, in some they feminize males, in some they allow females to reproduce parthenogenically, and then there are several documented cases of more complicated interactions in the form of cytoplasmic incompatibilities. Some are now investigating their potential use in biocontrol of malaria vectors and other insect pests, taking advantage of these manipulative tendencies. Thanks to Mike Charleston for this nomination. But some of the things they do, such as killing of male embryos, have no evolutionary advantages to them, since it does not increase the number of females through which they can be transmitted, and at the same time dramatically skew the male to female proportion, making mating harder and mutation for resistant genes more favorable. Actually, there may be an evolutionary advantage to male killing - in species where there is inter-sib competition, including those insects where larvae eat eggs. Gregory Hurst has written a lot about these scenarios. See one such review of this here. I guess as yet another little side note to Wolbachia (and there are quite a lot of these coming out these days), there are now evidence which indicate Wolbachia can provide some fitness benefits to certain host insect species, ranging from supplying trace nutrients like certain vitamins, to protections against viral infection, to who knows what else. There's too many for me to cite here, but I can think of at least 5 or 6 relevant studies off the top of my head that were published in the last two or three years. Just goes to show, all symbionts exist along the parasite-commensal-mutualist continuum and where they sit is often context-dependent. Where is this image from? It's terrific.